Daniel Pel presenting a message. Although my husband Taka and I had been “God-fearing” people (I had been raised a Catholic and my husband a Pentecostal), we knew there was greater truth to be discovered as these denominations seemed to stray from what the Bible teaches. 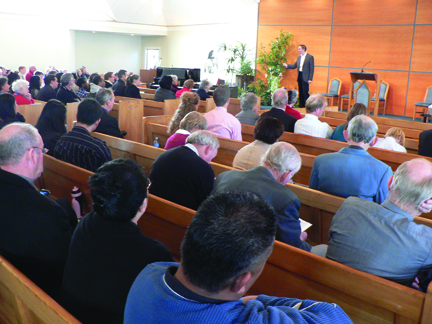 We had visited a Seventh-day Adventist church a few times. 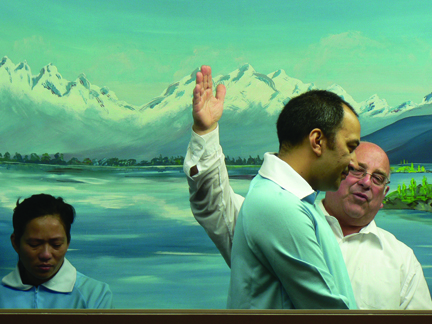 We had even witnessed a Seventh- day Adventist baptism and were moved, but not personally convicted, by their commitment. I have a friend who is a Seventh-day Adventist, and she invited us to church sometimes. One day she invited us to a seminar called “Prophecies Revealing the Future.” I mentioned this to my husband, and he told me he had seen a billboard along the road advertising the seminar. We went to the seminar and listened to David Asscherick. We found the first day boring, but came again the second day. It became more interesting, and we kept coming to every seminar until the earthquake disrupted everything. The meetings resumed after a while and we attended all but the last two as my husband had been transferred to the night shift, but we listened to the audio on the Internet. One night, a card was given out asking if people were interested in baptism and attending a church that had the Bible as its only authority. We thought we had gleaned enough truth to say yes to both questions. Toward the end of the series, David Asscherick mentioned that he would be preaching at Ilam church about the two witnesses, so my husband and I went to church on that Saturday morning and were surprised to find they were having a baptismal service that day. I wondered why no one told us about this as we had wanted to be baptized too! I started to cry and said to Taka, “I want to be baptized today.” We felt overlooked by God and thought we had missed out on the opportunity to be baptized. I saw Daniel and Silvia Pel in front of us and thought maybe they could lead us to baptism, as we knew they were part of David’s team. We left church that day immediately after the baptism, feeling dejected, but God has a plan for those who seek Him in truth! Taka and Rona commit themselves to God in baptism. A couple of days later we had a message on our phone from Daniel asking if we wanted to have a Bible study. I rang back and said, “Yes.” I really wanted to ask questions. Taka rang that night as usual from work, and I told him about the Bible study, and he wanted to be there too. I arranged a suitable time for everyone. We started having regular Bible studies with Daniel, Silvia, Samuel and Amber, and the Holy Spirit spoke to us over the next few weeks. We followed Daniel’s series on the books of Daniel and Revelation online. We attended Sabbath service a couple of times and eventually met Pastor Mel, who would baptize us. 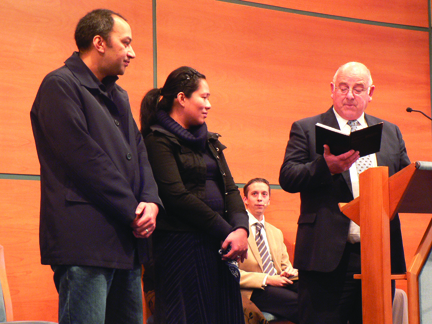 Taka and Rona taking their baptismal vows as Daniel Pel looks on. the next day, the Lord was committed to us! The boss told my husband that he would move him to the day shift as a supervisor over 120 people. 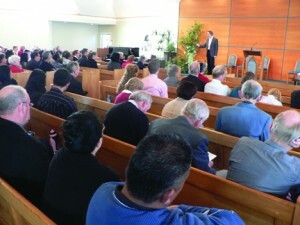 Taka immediately went to a quiet place and dropped to his knees in thanksgiving to the Lord. We had asked the Lord for one night off, but He gave us five days on the day shift. Through faith the Lord had shown us His way, and He had taught us patience. “Them that honour me, I will honour.” 1 Samuel 2:30. We felt as if we were part of the Bible story of Daniel 3:12-18. We were eventually baptized in the Lord’s time, and we are more appreciative due to the extra wisdom gained in the process. We are so grateful to the Lord for showing us his life-saving truths in the Bible through His servants, David, Daniel, Silvia, Samuel and Amber. We continue to study His truth and hope we too will share in the work of spreading the good news. God is so good! By Daniel Pel. Daniel resides in Norway with his wife Sylvia. They spread the gospel worldwide through Living Water Ministries. Email: daniel.livingwater@gmail.com. Website: www.livingwater.no. ‹ 03/17/2012: Kindergarten in the Amazon?